Pretty Pink Posh January 2016 New Release Blog Hop! Welcome to Pretty Pink Posh product release blog hop! You should have come from the talented Yuki Yoshioka‘s blog. But if this is your first stop, don’t worry, I will have the full list of participating designers towards the end of the post. The first die set is called Stitched Tabs dies, the second is called Storybook 3 die and the third is called Square Scalloped dies. The third die is exclusive to Pretty Pink Posh shop. Then there is a new sequins colour called Sea Breeze. This is a gorgeous vibrant blue. I love this blue. Then there is Gold, Silver and Iridescent mini star confetti. Love these! Finally there are two sequins mixes – Share Kindness mix and Sweet Pea mix. You can find them all at Pretty Pink Posh shop! 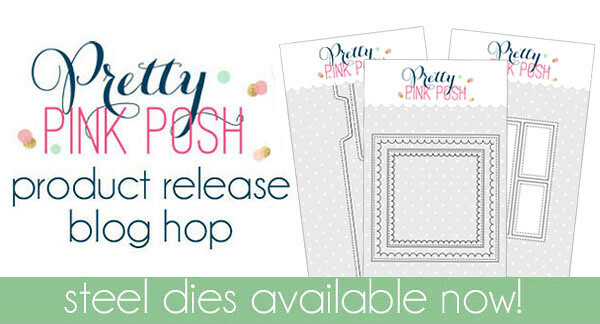 I have two cards showcasing the new Pretty Pink Posh dies. On my first card, I have used Storybook 3 die. This die is normally used as a frame for shaker box or just as a frame to layer on the card front. I wanted to use it for the background on my card. So I die cut a white panel with this die by placing it randomly covering the entire panel. I adhered this frame without the insides on to a white card base. For the fillers, I die cut watercolour cardstock a few time. I want only the filler rectangles. I coloured the filler rectangles with pink Zig watercolour pen in ombre fashion. For the second layer, I added pink pearlescent and final layer gold pearlescent from Zig Pearlescent Watercolour also from Pretty Pink Posh shop. Then I put the rectangle pieces back into its place like a puzzle using liquid glue to keep them in place. I LOVE how the background turned out. The pearl touch is so pretty in real. For the focal sentiment, I used Simon Says Stamp Thanks die in black with bunched up gold thread behind it. Finally I used the pink iridescent sequins from Sweet Pea sequins mix along with Gold metallic sequins. Here is a closeup. For my second card, I have used the Stitched Tab die set in rainbow colours. For the focal point, I used Simon Says Stamp Congrats die. I die cut a two in black and one in black glitter cardstock. I then stacked and glued them for dimension. Then I spattered some iridescent mini star confetti and glued them down. This was a time consuming but I love the effect. Here is a closeup. And a flat version of the card. Hope you like my project today showcasing the new gorgeous and versatile dies from Pretty Pink Posh. You will go back to Pretty Pink Posh Blog now. Here is list of all the designers participating in the blog hop. No blog hop is without prizes, Paulina is giving away two $25 gift certificates. Winners will be picked randomly along the blog hop. So make sure you leave comment on all the blogs. All comments must be left by 11:59 PM PST on 1/1/0/2016 Winners will be announced on Pretty Pink Posh Blog. So unique each and everyone Gayatri. Gorgeous. Gorgeous cards! 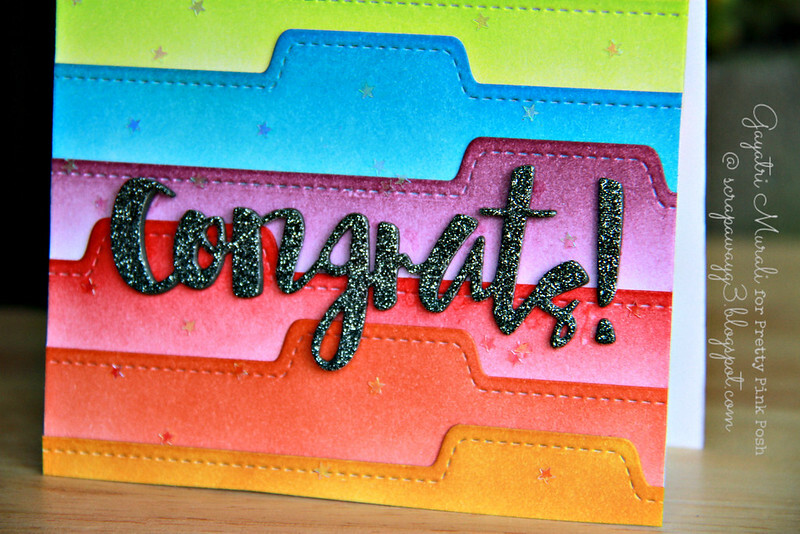 I really like how you used the stitched tabs on the Congrats card!! Thanks for sharing!! Beautiful! Love your use of color and how you used the tabs layered. Such awesome card design! Love all the pop of colors!! Great Job! Oh my, love those backgrounds! 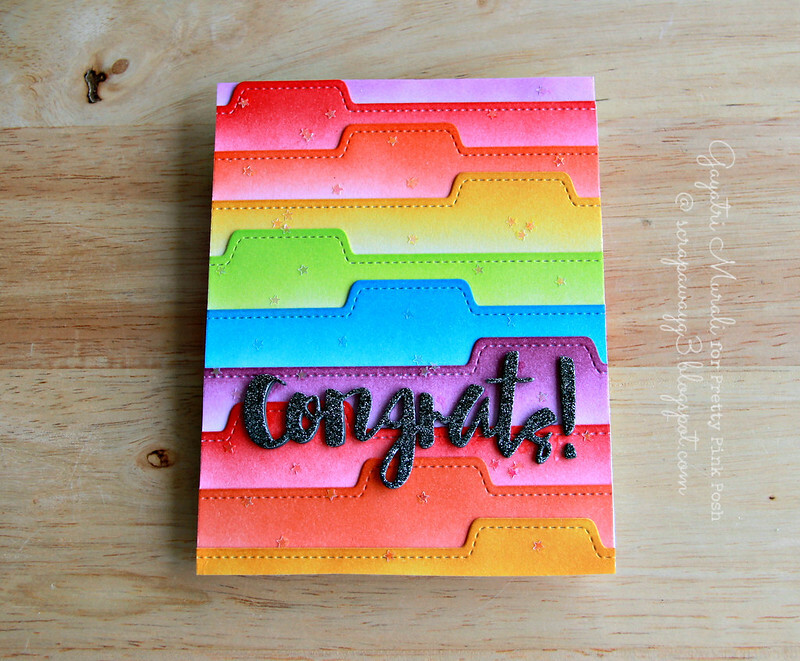 Love the rainbow file tab congrats card! What a unique and fun idea! WOW! I loved how you turn your cards into a rainbow. Very pretty and cheery cards!!! Oh, wow! Just gorgeous. The colors look amazing. Your cards are very creative and different, they are a true inspiration! TFS you style. As always, your colors are amazing and your use of the dies so creative. Thanks so much for a fun hop! Beautiful, thank you for the creative inspiration. What a creative use of the dies! 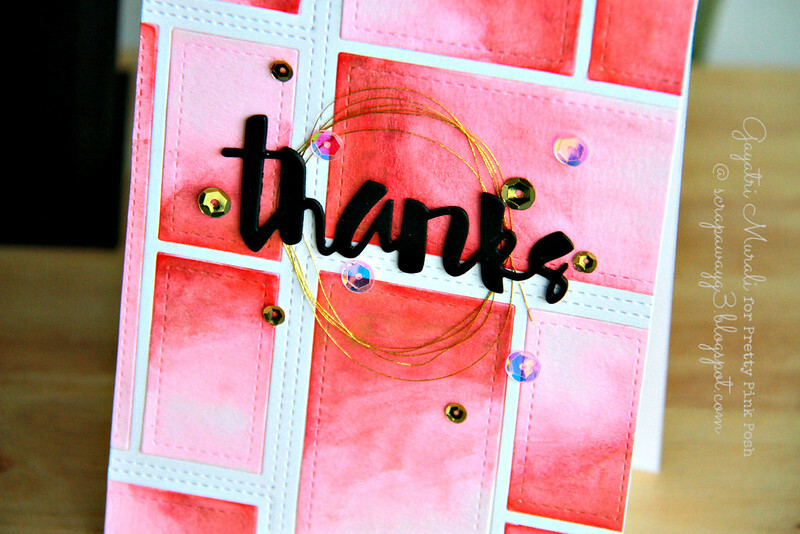 Gorgeous cards especially your second card using the file tab die!! Great cards! Such beautiful colors! Love the rainbow card, so bright and happy! Wow, great cards! I really love the rainbow one with the tab die. Beautiful! Thanks for sharing. Gorgeous cards! Love what you did with the dies. The tab die one is so clever! Great job!! Great cards Gayatri. I like your creative use of the dies. Thanks! Love your use of color. Always grabs my attention. What a clever use of these dies! Awesome colors! So happy looking cards! I like the way you use the dies. It is very inspiring. Wow….creative use of the tabs!!! Such pretty panels. Your card with the stitched tabs is so much fun! Great cards! I love the bright bold colors you used! Your rainbow tab card is beautiful!! luv all your color designs with the new PPP products! So bright and so fun!!! Love how you used both of these new dies on these cards!!! I just love love how you did the colours and used the new tab die in the second cards, so cool! Beautiful work on both cards!!! Absolutely love these cards! Thanks for sharing them with us, they are wonderful! Love these bright beautiful cards. I can see already from your gorgeous cards how fun and versatile these new dies are. Fantastic! Love your cards. The colors are great! Thanks for being so inspiring! Ohhh what a great idea to use it as a background ! Stunning. I love how beautiful and colorful your cards are! Just gorgeous! Wow! These are fantastic designs! The cards are colorful & creative, and really do a great job of showcasing the new products in the PPP release!!! WOW… WOW… Gayatri, they are STUNNING AND COLORFUL!! Love your beautiful card designs! Love them! love the colors! great designs! Great inspiration. Your cards are so vibrant and engaging. Amazing. Love the congrats card! The rainbow effect and divider tabs look great here. what a cool set of cards!! Very nice Gayatri. So bright and cheerful! Wonderful cards! I really love your use of the Storybook 3 dies and your color combos. Awesome new dies! Love the cards and products used. Fun release! Gorgeous cards, love the die cuts as background with these pretty vibrant colors! So creative!!! Absolutely love how you used the dies. Both of your cards are so pretty and creative!! Love the way you showcased the new dies! I love the colorful Congrats card!! I love your watercoloring and colors you used along with the dies!! Wow! So colorful and fun! What an awesome idea to use the die and colour each rectangle differently – LOVE IT! What a neat idea to make the panel front and I LOVE your rainbow folders! 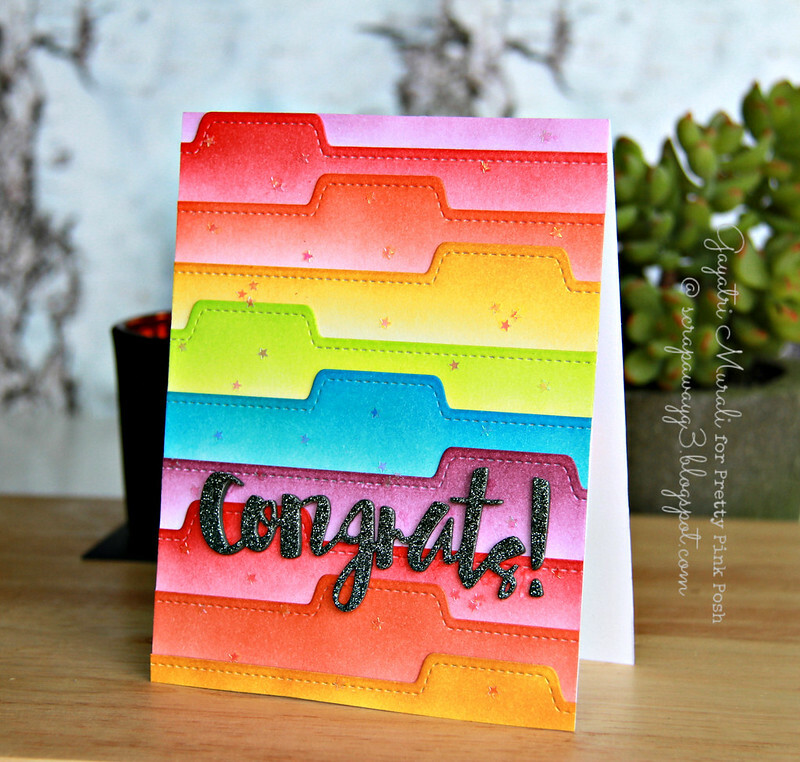 loving the colorful congrats card-so cool! what a great way to use that die! love the release! nice cards! Fabulous cards! Love the way you used the dies! Vibrant and fabulous Gayatri!! Love that you used the Sweet Pea Mix!! I love the tab dies and the vibrant colors that you have used. Great cards! is. Love the fun vibe! What a fun way to use these great new dies! Rich and vibrant color Scheme! And love all the new dies! Love your cards, very creative. What a pop of color these cards are! Thanks for the chance to win! Wow! So colorful and fun!!! I especially love that first one! Such an artsy vibe to it!! Your designs are wonderful – what great colors. Love it!!! Love the stitching on the cards and the colors! Beautiful cards! Such great use of color and the dies! Gorgeous cards. Love the rainbow tab card, great design! Love the creative use of the dies! Both of your cards are so fabulous! I love the creative use of the dies and the fun bright color combos on each! Gorgeous! So bright and cheery! I love the way you use your imagination and stretch the dies. Wonderful cards. Gayatri, absolutely stunning cards and I love your use of the stitched tab dies, which by the way I'm getting me some. Thanks for your inspiration Gayatri and I hope to see more! What fun cards! I love colours so my favourite is the stripey, vibrant one! Gorgeous!! Love to see unique ways of using the dies, the colors are so much fun as well! Thank you so much for sharing! Love how you used the dies as backgrounds! Great way to use these dies…so many wonderful ideas. Ohhhhh I love these backgrounds! Wonderful backgrounds on both your cards! Beautiful! What a clever way to use the new Storybook die! I love it! The stitched tabs are great for a new job card! LOVE your VIBRANT colours and EXCITING designs!!! I love these cards!!!! They're so GORGEUS!!!! Beautiful colors!! Fun cards !!! Love all the colors you used and mixing them with the PPP sequins. I absolutely love the pretty & vibrant colors!! I love how you used the dies!! thanks for showing how you lined up several dies to make one cut. Fun idea that I'll be using. the designs and colors on both cards are wonderful. Your use of the new dies is so clever. Great cards. so unique and very inspiring!!! Thanks for sharing your fantastic cards. I love the rainbow colors! Awesome! Beautiful cards Gayatri!! Nice idea with the tab die. Beautiful cards! I love how you used the Storybook stitched dies to create a background! The watercoloring is amazing and really make the card special. The other two cards are wonderful withe bright colors and layers of the file label. A dynamic duo of delight, Gayatri! I'm especially smitten with the way you've used the tab die; one I *might* have overlooked had I not seen you work magic with it! Fabulous showcases of the new PPP release; my wish list is now a wish novel! Love your creativity and bold color combo. Great cards! Very cute cards! I can't wait to get my hands on some of those mini stars. They were sold out today when I went to PPP online store. Thanks for sharing!